"Avengers: Infinity War" hits theaters on April 27, but the new official trailer holds plenty of clues as to what is in store for Earth's Mightiest Heroes. “Avengers: Infinity War” is the biggest event the Marvel Cinematic Universe has ever offered. Pulling together characters and clues from across the franchise, the past 10 years of Marvel Studios’ huge run is finally culminating in a two-part Avengers epic that will rock audiences and change everything. Seriously, everything. There’s been plenty of speculation about which characters will die and other surprises, but the official trailer for “Avengers: Infinity War” holds plenty of clues about what is to come for Earth’s Mightiest Heroes. Here’s everything we noticed and what it could mean for the MCU going forward. The trailer kickstarts with an ominous spaceship over Manhattan. Thanos has arrived! And Gamora, his daughter, explains to Tony Stark just who her father is and why he’s on a quest to wield the Infinity Gauntlet, that badass gold glove that holds all of the Infinity Stones. Once Thanos has all the Infinity Stones, he can easily destroy the universe. Several of the Infinity Stones have popped up over the course of the MCU films, from “Doctor Strange” to “Guardians of the Galaxy” (and even that really bad Thor movie). There’s still one Infinity Stone that hasn’t been shown, the Soul Stone. This will likely come into play either in “Infinity War” or the second part, the Untitled Avengers sequel film due in the spring of 2019. Maybe Captain Marvel has it? There’s also a quick shot of three key Avengers: Black Widow and Bruce Banner have reunited! But more importantly, Rhodey is suited up in his Iron Patriot gear. Rhodey was still learning to walk courtesy of Tony’s technology at the end of “Captain America: Civil War,” so this is a big development. Speaking of the Infinity Stones, Vision currently has the Mind Stone lodged in his head, and an ominous glance between him and Scarlet Witch speaks volumes. Vision is hiding out in Wakanda, but he’s a big target for Thanos. Lucky for him, Scarlet Witch has a soft spot for him, and she just happens to be one of the most powerful beings in the MCU. Wanda already controlled the mind stone in “Civil War,” so she could be the key to keeping Vision alive. Captain America and Black Widow have arrived in Wakanda, which would arguably be the safest place to hide Vision. The Avengers might have split up after “Civil War,” but just behind them are Rhodey and Bruce Banner. The feud between Captain America and Iron Man must be over, and Rhodey must not harbor any ill-will towards Cap, Falcon, or Vision, all of whom had a hand in his accident. Banner (who was busy with the events depicted in “Thor: Ragnarok”) has also finally teamed back up with his friends. From here, there are teases of a flashback sequence, giving us some insight into Thanos’ backstory. Thanos is a Titan, but he was born with a physical deformity (the Deviants gene), which made his mother try to kill him at birth. Thanos eventually falls in love with Mistress Death and becomes the powerful, nihilistic murderer shown in the trailer. That tiny green hand gripping onto Thanos? It seems to be Gamora as a child. In “Guardians of the Galaxy: Vol. 2,” Gamora and her sister, Nebula, talked about how Thanos would make them fight as children, training them to be soldiers. Gamora always won, and has Thanos’ favor. She could be a big key in taking down Thanos…or she might be a liability for the Avengers. “The end is near. When I’m done, half of humanity will still exist.” These words are spoken by Thanos, who grips Thor’s head, making the God of Thunder scream in agony. Thor isn’t a human, but it’s an ominous sign that he is shown in the clutches of Thanos just as he speaks about death. The Russo Brothers have been pretty frank about everyone’s favorite Avengers dying (not to mention many of the actors’ contacts being completed), and it feels like fans might be saying goodbye to Thor this time around. 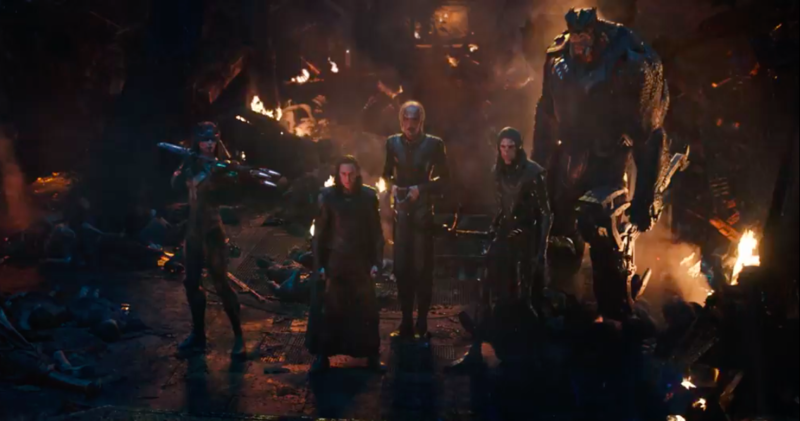 Just after Thor screams, there’s a quick shot of the Black Order, Thanos’ powerful alien supervillain team. There’s Black Dwarf, Proxima Midnight, Corvius Glave, Ebony Maw…and Loki. Thanos then squeezes the Tesseract, turning it into the Space Stone. It seems like Thor has been betrayed by his brother once more, and Loki definitely stole the Tesseract from Odin’s Trophy Room at the end of “Thor: Ragnarok.” Seems like his change of heart wasn’t permanent. The battle has come to Wakanda, and even Tony’s Hulkbuster armor doesn’t seem to stand a chance against Thanos. While the sight of Tony with his armor half-destroyed does seem ominous, the Avengers can’t quite exist without Tony, even if he’s just pulling the purse strings offscreen. Instead, it’s the shot of Thanos pouncing towards Cap that seems more telling. Although Steve is holding back the Infinity Gauntlet, time could be up for Steve Rogers during the Infinity War. The films have quietly teased the Winter Soldier as Captain America, something that happens in the comics, so there could be a very emotional goodbye to one of the MCU’s biggest heroes. One last thing to note: The Infinity Gauntlet only holds two stones, the Space Stone and the Power Stone (which the Guardians were in possession of). For the moment, it seems Vision and Doctor Strange, who holds the Time Stone in his Eye of Agamotto amulet, could be safe. But there’s always Part Two. “Avengers: Infinity War” hits theaters on April 27, and advance tickets are now on sale via Fandango. A complimentary “Infinity War” poster is also available with every VIP purchase of advance tickets while supplies last.